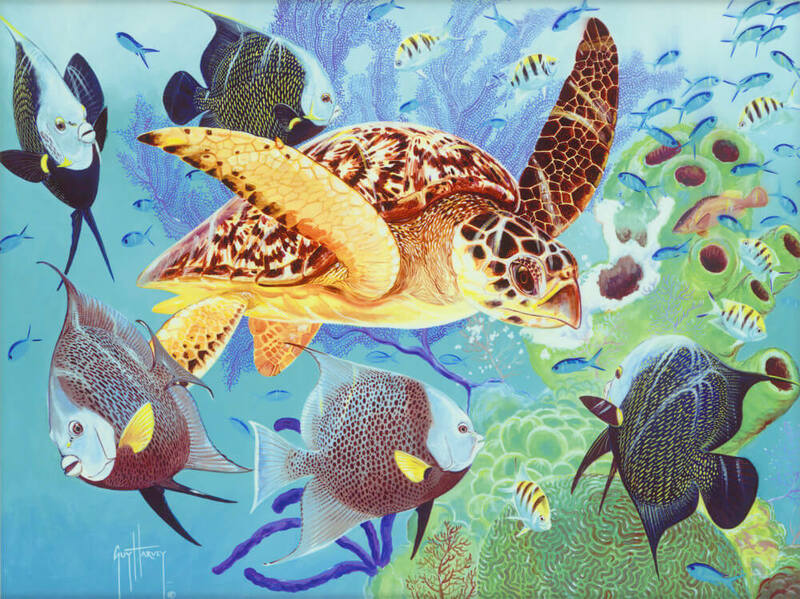 Guy Harvey is a marine wildlife artist, scientist, and conservationist who reproduces his authentic artwork on a range of merchandise to share his passion for ocean life with the world. Harvey has earned multiple awards and honors for both his artwork and his efforts in promoting and conserving ocean wildlife. Harvey was born in Bad Lippspringe, Germany on September 16, the son of a gunnery officer in the British Army. He grew up in Jamaica, the country of his English ancestors who immigrated there in 1664, making him a 10th generation Jamaican of English heritage. As a child, Harvey spent much of his time fishing and exploring nature with his family in the Caribbean. He distinctly recalls his mother hooking a blue marlin and was enchanted by its beauty. His love of depicting nature surfaced during boarding school, where he often sketched birds and fish. Harvey’s passion for marine life grew after reading “The Old Man and the Sea” by Ernest Hemingway for a school project in 1971. Harvey claims to have read the novel “at least 100 times” since. Two years later, Harvey has his own adventure paralleling Hemingway’s story, when he caught his first blue marlin. Though he loved art, Harvey sought a science-based education, inspiring him to study marine biology at Aberdeen University in Scotland. As he studied, the self-taught artist was able to supplement his income by selling artwork. He earned a first class honors degree in 1977, and obtained a doctorate in fisheries management at the University of the West Indies in 1986. In 1984, Harvey met his future wife, Gillian, who encouraged him to exhibit his works of art in local shows. Nature lovers and anglers flocked to his artwork, many of whom requested commissioned works. A year later, a successful solo exhibition featuring 44 original drawings based on “The Old Man and the Sea” catapulted Harvey into the world of art. 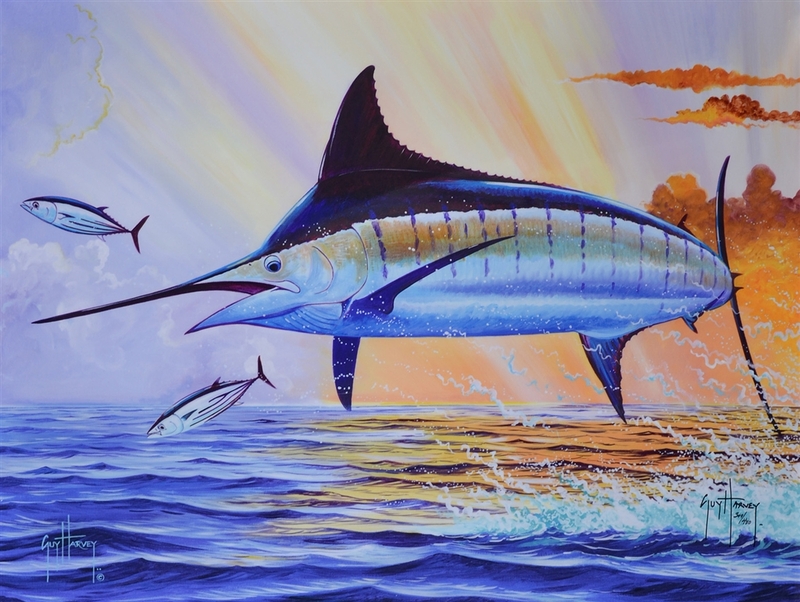 By 1988, Harvey became one of the world’s top saltwater game fish artists. He uses his education and his experiences to create marine wildlife art with unparalleled authenticity and appeal. 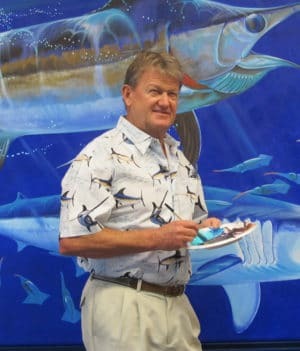 In addition to his paintings and graphic works, Guy Harvey murals can be found at the Fort Lauderdale Airport and at Nova Southeastern University in Florida, and is seen all over the world thanks to his game fish clothing and accessory designs. Harvey continues to blend his passions, working not only as an artist, but also as a scientist, conservationist, diver, and an angler in support of “catch and release” fishing ethics. He and his family live in Grand Cayman where he maintains his art studio. 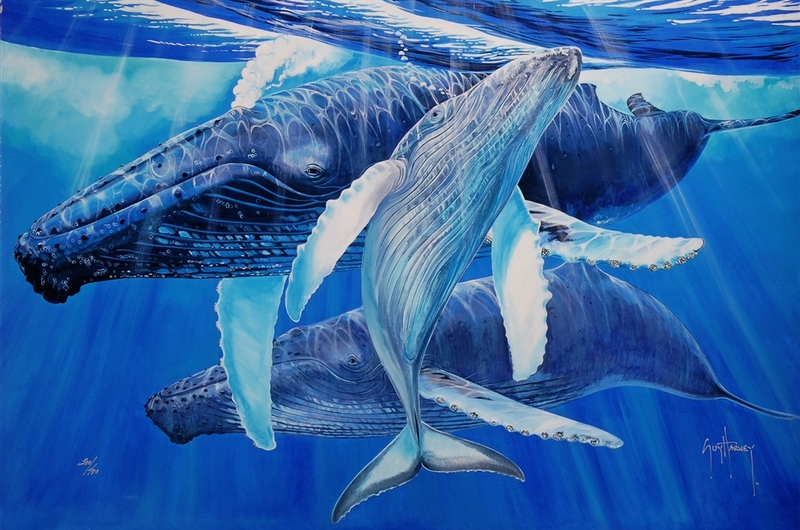 Harvey’s artwork focuses on the realistic portrayal of warm water marine animals in their natural habitats. 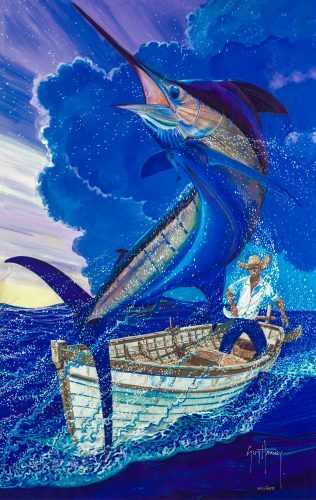 He has painted everything from sea turtles, mahi mahi, and dolphins to whale sharks and his favorite subject, the marlin. Harvey did not begin his artistic career as a painter. When conducting his research in the ‘70s and ‘80s, he needed to accurately depict what he was studying. In addition to photography, the self-taught artist employed pen-and-ink drawings. He used techniques known as stippling—creating an image using numerous small dots and specks—and cross-hatching, which is shading a drawing using intersecting lines, to create detailed illustrations of ocean wildlife. Harvey later expanded his repertoire to include watercolors, oil, and acrylic so he could produce larger images faster and in color. By merging both his studies of marine wildlife and creative studios, Harvey has earned a reputation for depicting animals in dynamic poses and incredible accuracy. In 1999, Harvey formed the Guy Harvey Research Institute in collaboration with Nova Southeastern University to protect fishery resources on a global scale. In 2002, Harvey premiered his TV show, “Guy Harvey’s Portraits of the Deep,” which blends sports fishing with education. The show went on to become syndicated. In 2008, the Guy Harvey Ocean Foundation was established to educate and fund projects that conserve marine environments. In 2015, Harvey painted the hull of Norwegian Escape. In 2015, Harvey established the Guy Harvey Oceanographic Center and the Guy Harvey Endowed Scholarship to encourage the next generation of ocean researchers. Harvey created a unique line of coastal lifestyle sportswear and clothing that has become immensely popular.